Summary: The lovely, fair Finnula Crais is the youngest lass of six sisters and one brother; also the most prone to trouble. She prefers breeches over dresses and can outhunt any and all men in the land. But what happens when she has to hunt for a man? A man who has riches to bless upon her sister. Never shy from a challenge, she starts out, only to find Lord Hugo Fitzstephen; earl and master of the land she lives in. Coming back from the Holy Wars, Lord Hugo is surprised by the fair Finn in her breeches and hair. Caught by her snares, they start on an adventure that neither of them will forget as love crosses their path while evil crosses the land. Attempted murders, claims of betrayal, and a bond of love that is unbreakable, lead this tale to an ending that no one could see coming. Courtney’s Review: Hurrah for Princess Mia! When I saw her, Ransom My Heart, for the first time last year, I knewI HAD to read it. 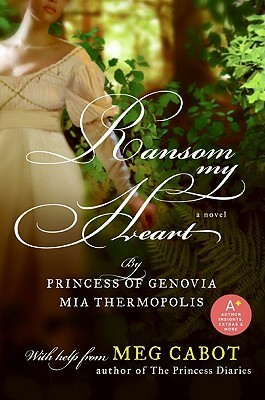 I’ve read mainly historical romances, so when I read this one I was surprised at how much effort she put into this book. The Fair Finn is what I think every girl wants to be: an excellent marksman, daring, adventurous, a great cook, and up for just about anything. In England 1291, it was a taboo to wear breeches, of which she did anyways. I liked how Lord Hugo is also a very distinguished part of her society, but she doesn’t know until she returns home after a series of romantic exchanges and the idea of Brother Robert beating the crap out of him. I didn’t know that there could be so many challenges in life that lead to betrayal later that would bring them, ultimately, closer. I can’t really describe what I don’t like about this book. It is one of my favorite reads, but if I had to choose something to nag the sweet Princess Mia about, it would be that everyone seems to seem just a tad bit too innocent. Maybe roughen some of the characters up just a little would help keep people guessing of who-did-what. This book is one that I keep under my headboard so it’s within reach for me to read at any time. Ransom My Heart captivates you and makes you cheer for Fair Finn and Lord Hugo to make it through to the end. It is definitely a book worth writing a sequel to. I mean, what happens after the Fair Finn is done embroidering and draws her knife again?